This intimate 3-day dissection-centered course forces on complex skull base approaches including the fronto-orbitozygomatic, pericavernous, middle fossa anterior petrosectomy, translabyrinthine, far lateral. 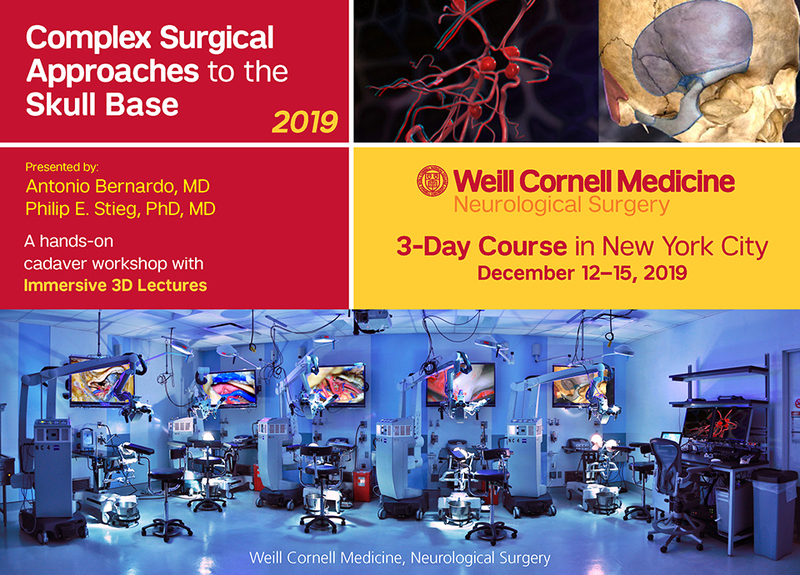 All material is presented in an immersive 3D format in Weill Cornell’s state-of-the-art Neurosurgical Innovations and Training Center. Participating surgeons work at 3-D interactive cadaver workstations, where they watch cadaveric dissections and review surgical anatomy—all in 3D—before and during their own dissection. The combination of the 3-D virtual reality environment and the cadaveric hands-on dissection affords surgeons excellent preoperative training and rehearsal of current, complex approaches in cranial base surgery. Practicing neurosurgeons, otolaryngologists, fellows, and residents in training. Nearby hotels include The Bentley Hotel and the Gardens Suites Hotel by Affinia. Additionally, on-site accommodation is available at the NewYork-Presbyterian Helmsley Tower Guest Facility.